There are nine undefeated teams left in college hoops, from top-ranked Syracuse all the way down to Murray State, but the Baylor Bears might be the most interesting. Scott Drew, son of long-time Valparaiso coach Homer Drew and brother of March Madness hero Bryce Drew, has been the coach since 2003, and his program has not lacked for excitement. After four years near the bottom of the Big 12 heap, he broke through in 2007-08 with an NCAA berth. The next year, his team made the NIT championship and lost. Then, in 2010, Baylor had its best year to date, reaching the Elite Eight and losing in a thriller to eventual national champion Duke. After a bit of a hiccup last season, Drew has perhaps his best Baylor team to date. The time Drew sent recruits a flier a featured a photo of him standing between Bob Knight and Billy Gillispie, with the caption: “Which of these Big 12 coaches has signed a McDonald’s All-American?” A red ‘x’ was drawn over Knight and Gillispie’s faces. Drew apologized only after Knight confronted him in a bathroom. Drew’s hiring of Dwon Clifton, John Wall’s AAU coach, for the perceived benefit in recruiting Wall to Baylor. Texas coach Rick Barnes took him to task, and let reporters know that he didn’t like Drew’s approach. A similar hiring of a Houston-area high school coach with a reputation for luring top Texas talent. Approve or disapprove, there’s no denying that Drew’s relentless recruiting has garnered him one of the most talented teams in the nation. The frontcourt in particular, which features the talented trio of 6-foot-11 sophomore Perry Jones III, 6-foot-7 senior Quincy Acy, and 6-foot-9 freshman Quincy Miller, might be the country’s best. As a whole, Baylor is holding opponents to the lowest 2-point field goal shooting percentage in the country, due in no small part to the team’s interior height and athletic ability. Defense is the calling card of this team, but really frightening aspect for Big 12 opponents will be the 3-point shooting of guards Pierre Jackson (56 percent from behind the arc so far) and Brady Heslip. Smaller teams — a category that includes everyone else in the Big 12, according to Ken Pomeroy’s effective height metric — will have to sag down if they want to avoid being overwhelmed on the boards. Needless to say, efficient long-range shooting would provide a nightmarish dual threat. Baylor’s first real test came Dec. 4 at Northwestern, a quality Big Ten team looking to earn its first-ever NCAA tournament. A game before, the Wildcats hit 20 3-pointers to tie a school record in a rout of Mississippi Valley State, but against Baylor’s 2-3 zone, they shot just 4-of-26 for a meager 15 percent. First off, sorry for the insane perspective issue. Technical details are still being ironed out. 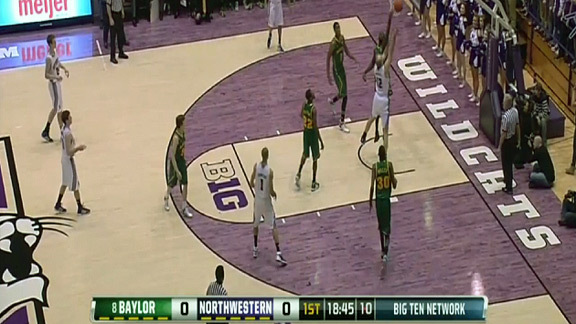 In case you were curious, Northwestern does not play on a giant sloped hill. Anyway, the Wildcats have the ball on the left wing, and Baylor’s zone, purportedly a 2-3, looks an awful lot here like a 4-1. 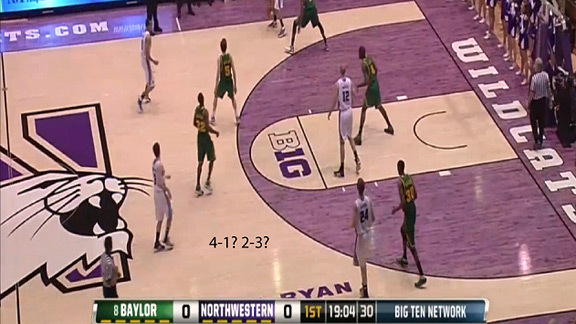 Let’s watch it transform as Northwestern run its offense. Now it definitely looks like a 4-1. 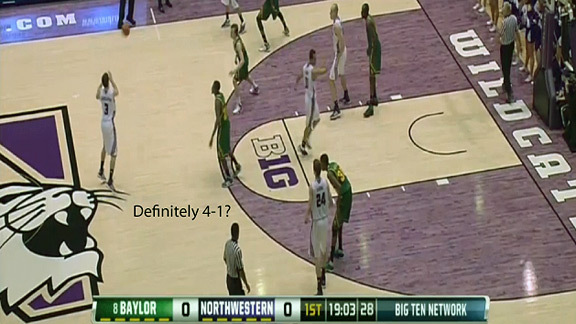 The Bears are clearly trying to stifle the 3-point line, and they clearly aren’t scared of whatever Northwestern might do inside. We’ll see why in a second. With the ball well beyond the 3-point arc, the zone transforms into a 1-3-1. Heslip, at the top of the key, drops to the middle to prevent the high entry pass. As the ball goes back to the wing, A.J. Walton comes back from his high on-ball pressure defense to the 3-point line, and Heslip moves to the top. We’re back to the 4-1/2-3 hybrid. Later in the possession, the ball is back at the top. 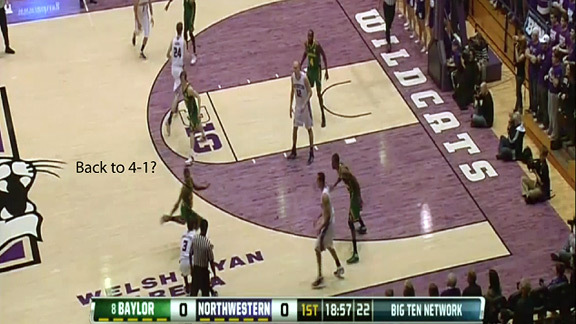 There are two possible points of attack for Northwestern. The first is an entry pass to the post. The second is a pass back to the left wing for a 3-pointer. 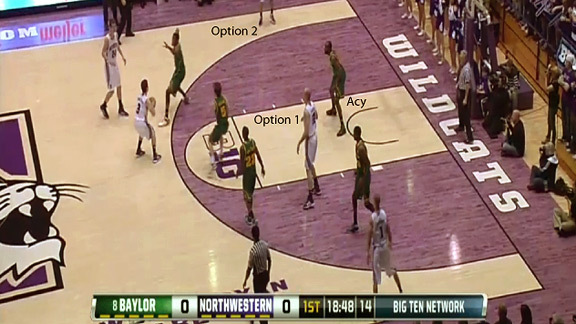 If the act quickly enough, Northwestern has successfully made one man, Acy, responsible for both options. This is what patience can do to even the best zone defense. Acy makes the interesting choice to cheat to the perimeter. It showcases two important points. 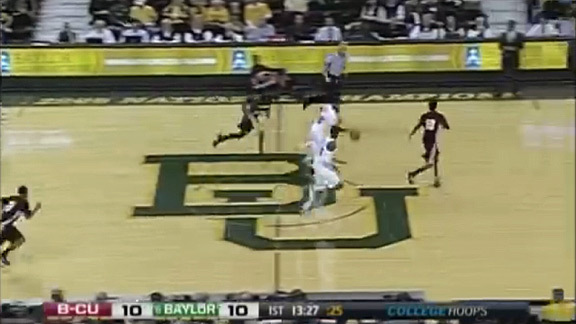 First, Baylor really, really committed to stopping the 3. Second, in what has become a recurring theme, the Bears are absolutely not afraid of getting beat inside. They have too much height, length, and leaping ability to worry about that. The Wildcat guard reads Acy’s anticipation and passes inside. The result? 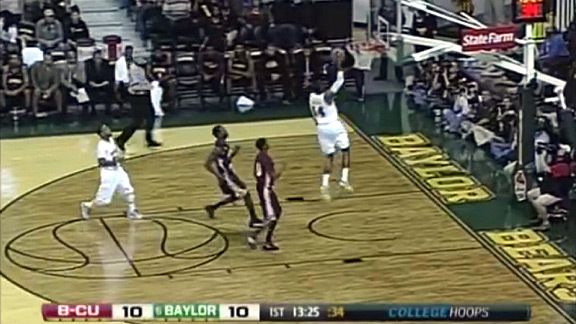 What should have been an easy layup gets swatted by Acy, and Baylor comes away with a turnover. The lesson the Wildcats learned, which would be repeated as the game went along, was that against the Baylor zone, life is unfair. You can beat it all the textbook ways, but they have the personnel to recover. 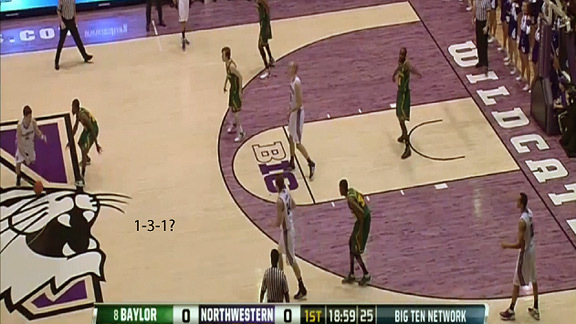 It’s why they kept up the 3-point pressure and reduced Northwestern to a shadow of its former self. The Bears would go on to lead by as much as 32, and the final score was 69-41. A total rout. 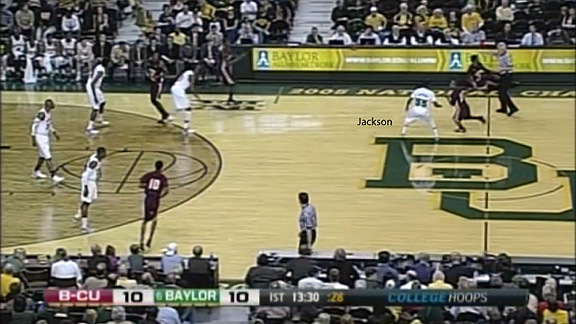 In this shot, Jackson is forcing his man to the right sideline, where an entry pass will be made. 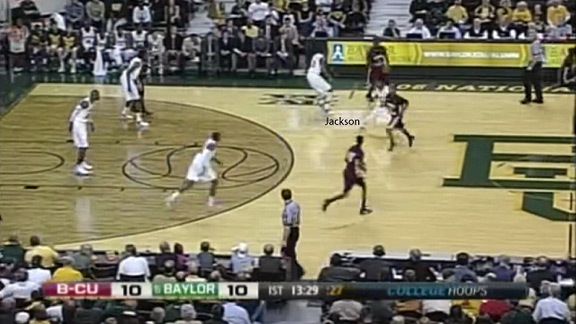 After the pass, Jackson’s man runs off the play as Bethune-Cookman sets up the cross-court pass. Jackson fakes like he’s following him, but you can already see in the shot above that he’s planting his right foot. Jackson, tricky devil, only feigned leaving the play. Instead of following his man, he stopped on a dime and anticipated the cross-court pass. It was a bright individual play, but it’s also a sign of the team philosophy — with so many talented big men, there’s no real risk in taking a chance like Jackson’s. The worst that could happen was the Bethune-Cookman player might have hit his man at the top of the key. Against a team with weaker inside players, that could create a detrimental advantage. But Drew isn’t concerned. He’s got Acy, Miller, and Jones to bail him out. 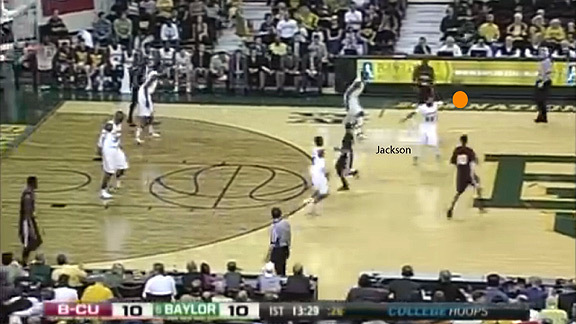 So guards like Jackson are schooled to go for perimeter steals like this one. And because of the security the big men afford Jackson, he comes away with the steal. It’s a 2-on-2 fast break, but teammate Deuce Bello has a step on the defenders to the outside. He makes the bounce pass, and it’s jam city for Deuce. At the end of his first decade as a head coach, Scott Drew has surrounded himself with an embarrassment of defensive riches. The effects of that excellence are felt in every aspect of the game, and even the best teams in the country will find it difficult to create points. Say what you want about Drew’s tactics, but he’s built a unit with national championship potential. Fantasy Fantasy Football Week 14: The Playoffs Begin!